The first part of the ride is pretty uneventful—just leaving Durango. But once we were in the mountains, I left the comfort of my seat in a covered car to brave the cold air of an uncovered car to take some photos of the stunning scenery. 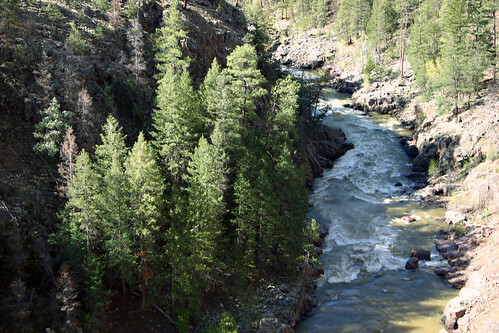 The path of the train follows the Animas River from Durango to Silverton. Over about 45 miles of track the train climbs almost 3000 feet in elevation. The original purpose of the train was to haul silver and gold out of the mountains back to the smelter in Durango. The track was laid in an astonishing eleven months and was operational immediately. This entry was posted on April 23, 2008 at 8:29 am and filed under Animas River, Colorado, Durango, Narrow Gauge Railroad, railroad, river, Silverton, train, vacation, water.